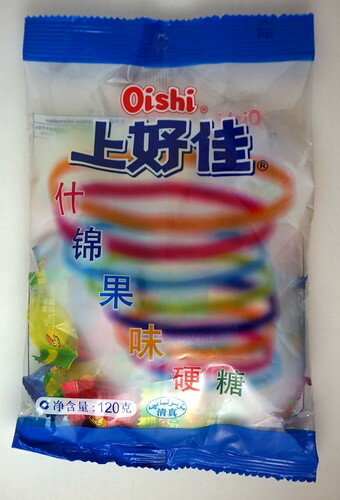 I bought these Oishi Hard Candies while I was in China (I did more than just hug pandas there!). 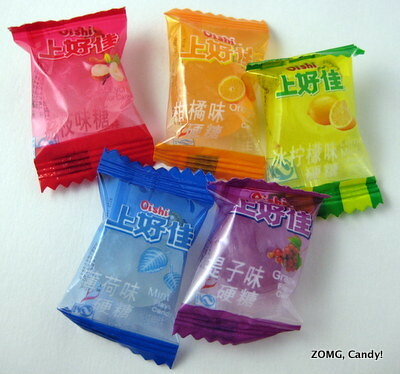 I don’t know the package says – I’m functionally illiterate in Chinese, so only recognize the character for fruit in the description – but I did manage to find them listed on the Oishi website, where they were just called Hard Candy. From the Oishi website, it seems like they sell those flavors individually as well. Cool Lychee (red wrapper; white candy) was a strange flavor. It was sweet to start, then took on a very genuine lychee flavor. I could even taste the slight edge of bitterness that lychees get near the pit. Unfortunately, the wonderful lychee flavor was soon marred by a methol minty finish. I guess that was the cool part. 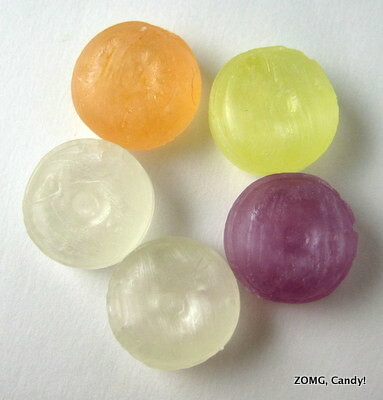 For me, the coolness ruined the candy. 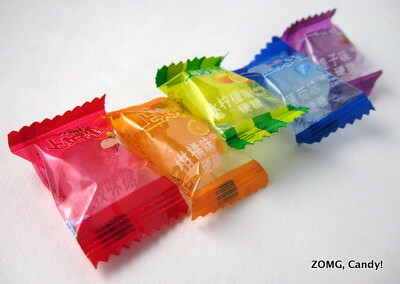 Orange (orange wrapper and candy) was brightly sweet with a zesty citrus flavor. It was a good, if standard, orange candy flavor, and thankfully no mintiness. Lemon Mint (yellow and yellow) started off sugar sweet. The slight lemon flavor was mild and slow to appear. Instead, it mostly tasted of menthol and made me think of cough drops. Blech. Mint (blue wrapper and white candy) was a mentholy peppermint. Not my thing. Finally, grape (purple and purple) was sweet and slightly tart with a tannic, red grape edge and no mintiness. 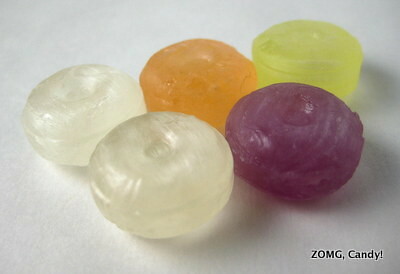 It was quite unlike American grape candies, which taste super artificial. Oishi’s take tasted like an actual grape. I liked the grape, and the orange was fine if standard. They get Os. The minty fruity hard candies, on the other hand, were too medicinal and/or weird for me and get a —.